Widely traded futures contracts for North Sea Brent crude oil in global financial markets are typically priced in U.S. dollars (USD). The appreciation, or increase in value, of USD against most other currencies since last summer can either mitigate or exacerbate the effects of the recent sharp decline in USD-denominated crude oil prices, depending on whether a particular country is a net importer or a net exporter of crude oil. For example, the price of Brent crude since July 1, 2014, declined by 56% through January 21 in USD. However, given the depreciation of the Indian rupee and Turkish lira against the U.S. dollar over the same period, Brent crude prices in terms of those currencies fell by only 55% and 52%, respectively. Turkish and Indian consumers are therefore experiencing a lesser decline in the cost of imported oil products than consumers in countries that use USD or currencies with lesser or no depreciation against the USD. In contrast, producers in countries that are net oil exporters, like Canada and Norway, find that the percentage decline in the price they receive from oil sales is lower than the decline in USD terms when they convert their oil sales revenue from USD to Canadian dollars or Norwegian kroner. 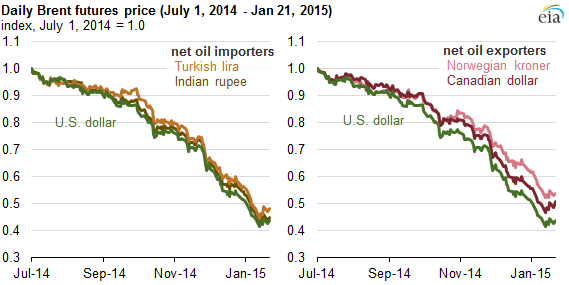 The price of Brent crude in these currencies has fallen only 49% and 46%, respectively, since July. Because some producer expenses, like wages and taxes, are primarily denominated in the home currency of the country where production occurs, the depreciation of the currencies of crude exporters against the USD is partially mitigating the adverse effects on producers of the recent fall in crude prices.